What did you do yesterday?? I think I might have climbed 500 ft. at the gym over the course of a couple of hours. Alex Honnold, on the other hand, had a pretty productive day out in Yosemite. According to this thread on SuperTopo Honnold climbed, by himself, both the Regular Northwest Face on Half Dome and The Nose on El Cap in a combined time of around 8 hours for a total of roughly 5,000 ft. of climbing on the day. Not bad. 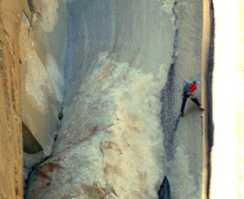 Check out the latest post on the El Cap Report for some shots of him scampering up El Cap. so he free-soloed changing corners?????!! LOL thats what I was thinking… can’t be right. actually i think the pic above is changing corners…. u can see him on an aid ladder off a bolt. Honnald is literally an insane beast man with gorilla strength arms and the endurance of a triathlon runner! There doesn’t seem to be a claim that he free soloed The Nose route – this is a great accomplishment! Fast aid soloing without a rope is usually done with a few daisy chains so you always are clipped into two or three pieces aka an “anchor”. This means you don’t have to rap back down and clean the pitch which is standard for aid soloing. Thus no rope but not free solo for more info see Metroviching.